Have you ever walked on the side of the river and put your foot in the water to feel the cold fresh water flowing on your feet? How about walking on the side of the river and putting your foot in the water to feel water at a temperature ranging from 55 to 80 degrees celsius? Taiwan is an island almost exploding with geo-thermal activity and the people here have learned to harness the energy into a relaxing experience. This small island country happens to be one of the top hot-spring destinations and has the greatest variety of geo-thermal hot springs in the world whether you're looking for hot-springs, cold-springs, mud-springs or seabed hot springs - Taiwan has it all. Its believed that having a geo-thermal hot-spring bath will help to increase your metabolism, accelerate healing, soothe muscles, improve blood circulation, and detoxify the body’s lymphatic system. One of the major destinations in northern Taiwan is the small Indigenous village of Wulai (烏來) in the mountains of south-eastern New Taipei City. Wulai has developed quite a lot and even though its transforming into an expensive touristy village with beautiful hot spring resorts and hotels popping up, for me, it still retains its quaint small village feeling that I experienced on my first visit almost ten years ago. Arriving in Wulai, you are automatically greeted by the “old street” which you will ultimately have to walk through to get to the hot springs resort area or to the river where you can take a free dip. The old street is a show case of Atayal Indigenous culture with shops selling millet wines and restaurants selling dishes with wild mountain meat, bamboo tube rice and wild-boar sausages. If you are brave enough, there is even flying squirrel on the menus of some restaurants. After passing the old street you cross a small bridge and you either make the decision to turn right towards the hot spring area or turn left to take the one or so kilometre hike to see the waterfall. 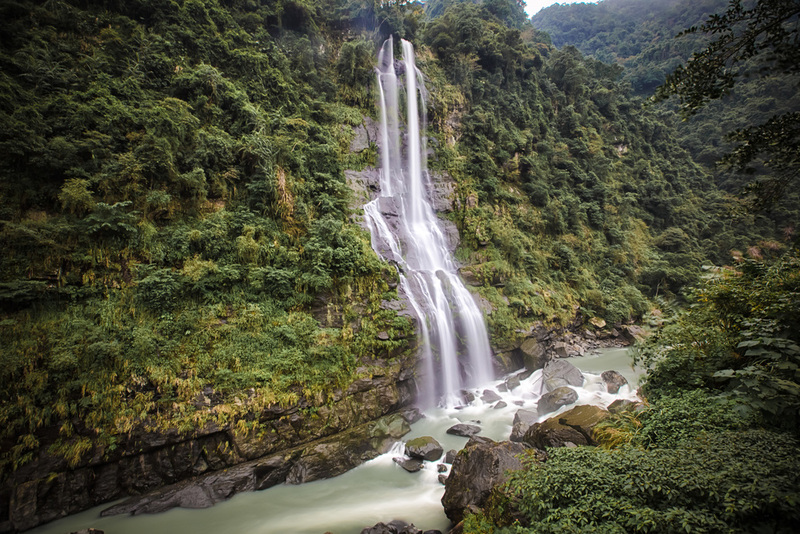 For me, the hike to the waterfall is always the best part of visiting Wulai. You get to walk up a paved mountain road with no traffic and excellent views of the Nanshi river below you. The hike isn’t that long and once you arrive at the waterfall there are a lot of things to see, eat and do. The waterfall itself is one of the largest in the country and depending on the time of the year and the weather the amount of water flowing varies. This visit had probably the most I’ve seen through all of my visits to the area. If you plan on driving, just take the famous number nine highway up into the mountains going towards Yilan county and follow the signs. If you drive however, be prepared for traffic jams on the weekend.